Unless you’ve been living under a rock, you are probably running/using Windows 10 right now. According to Microsoft, there are more than 400 million devices that are using Windows 10. But, if you’re an enterprise, you may not yet be using Windows 10. Perhaps you are starting to evaluate it, deploying Pilots or Proof of Concepts (POCs). However, it can be a challenge to identify which systems are good candidates for a pilot. or identifying which applications are most widely used (and therefore should be prioritized for compatibility testing), not to mention the countless number of hardware drivers you need to account for. It can seem overwhelming to plan for Windows 10, and it is. If only there was an easier way. Ah, but there is; thanks to Upgrade Analytics. Upgrade Analytics provides tools that help you to plan and manage the upgrade process. The solution identifies device, application, and driver compatibility issues that could cause some challenges in your upgrade process. If you’re familiar with the Microsoft Application Compatibility Toolkit (ACT), back when organizations were (and maybe still are) planning for the deployment and upgrade from Windows XP to Windows 7, the ACT tool enabled you to determine, before deployment within the organization, whether your applications are compatible with a new version of the Windows operating system (Windows 7 at the time). So you might be wondering why we can’t just use the same tool for Windows 10. “We’ve replaced the majority of functionality included in the Application Compatibility Toolkit (ACT) with Upgrade Analytics, a solution in the Microsoft Operations Management Suite. Upgrade Analytics gives enterprises the tools to plan and manage the upgrade process end to end, allowing them to adopt new Windows releases more quickly. Microsoft developed Upgrade Analytics in response to demand from enterprise customers looking for additional direction and details about upgrading to Windows 10. Upgrade Analytics was built taking into account multiple channels of customer feedback, testing, and Microsoft’s experience upgrading millions of devices to Windows 10. So, effectively we have a new solution that replaces ACT; namely, Upgrade Analytics. So where do we start? You should first start by reading the Manage Windows upgrades with Upgrade Analytics article. From this article, there are other details it provides, like how the service works via the Upgrade Analytics architecture, the requirements to use the service (i.e. Windows OS versions and KBs required), and how to get started with Upgrade Analytics. Aside from having an Azure subscription, and creating an OMS Workspace, there are a few other things that you need to do in order to leverage this solution. You will also need to subscribe to the Upgrade Analytics preview in OMS. You will also need to deploy the compatibility update and related KBs applicable to the OSes you are targeting (i.e. Windows 7 SP1 and Windows 8.1). The bigger component is the Upgrade Analytics deployment script. Microsoft has provided 2 versions of this script, one for use of a pilot (and testing/confirming configuration is correct for data flow), and another for wider deployment. You can modify the RunConfig.bat script as required (with your Commercial ID Key, and logging levels desired), and then create a Package in System Center Configuration Manager (SCCM) to deploy this to your entire environment. Then just sit back and wait for the data to roll in. Microsoft states that it generally takes 48 hours for the data to populate in Upgrade Analytics. Some of the features I like from this solution include the ability to track the number of computers that you have upgraded, as well as not only identify which computers have which applications installed (and their versions) but also a count of computers that opened the application at least once in the past 30 days! That’s helpful in potentially reducing application licensing costs. It also produces a list of computers that have no known issues or fixable driver issues, which you can export to a comma-separated value (CSV) file; and then use that to create a System Center Configuration Manager (SCCM) Collection for your Windows 10 Upgrade Pilot. Further, in identifying applications that may have issues with the upgrade, the solution also provides information from software vendors through the Ready For Windows program. Through the Site Discovery element, it also helps prioritize compatibility testing for web applications. If you’ve worked with Microsoft Azure before, or with the Operations Management Suite (OMS), you know that nothing is for free. With the shift to cloud/hybrid models, even if your infrastructure costs are offloaded to Azure, there is still usage costs. And, specifically from an OMS standpoint, there are costs based on either the number of Nodes connected to OMS, or the volume of data. However, Upgrade Analytics is different. This is because it is not actually using the OMS Log Analytics engine in the typical sense. When you opt into Upgrade Analytics your telemetry data is copied into your Log Analytics workspace which allows you to do searches, etc. of the data, just like any other data in Log Analytics. In fact, you don’t even need to have the OMS Agent installed on the endpoints you are targeting. After you enable Windows telemetry on user computers and install the compatibility update KB (1), user computers send computer, application and driver telemetry data to a secure Microsoft data center through the Microsoft Data Management Service (2). After you configure Upgrade Analytics, telemetry data is analyzed by the Upgrade Analytics Service (3) and pushed to your OMS workspace (4). 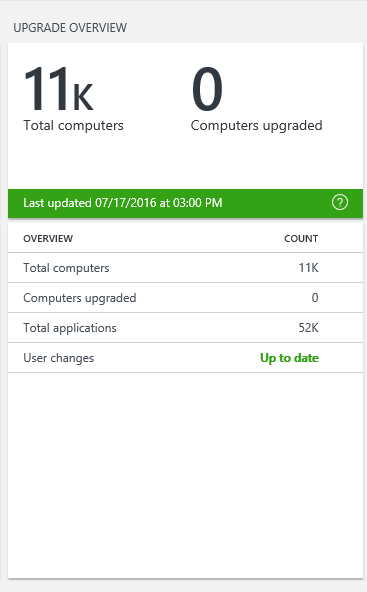 You can then use the Upgrade Analytics solution (5) to plan and manage Windows upgrades. Well, it means that customers are not charged for the data collected by Upgrade Analytics. 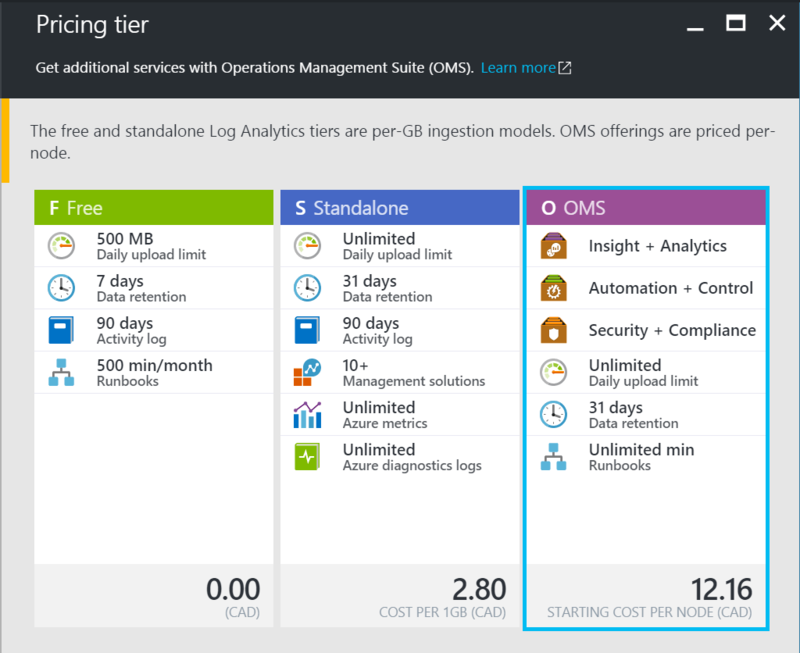 And if you are using the free pricing tier of OMS, the Upgrade Analytics data is not subject to the daily quota (i.e. you could have a million desktops reporting into a free work space and the data would neither be charged nor capped). The same applies if you use one of the paid tiers of OMS (i.e. “Standalone” or “OMS”). You will get 30 days of data retention, and no charge for the Upgrade Analytics data! 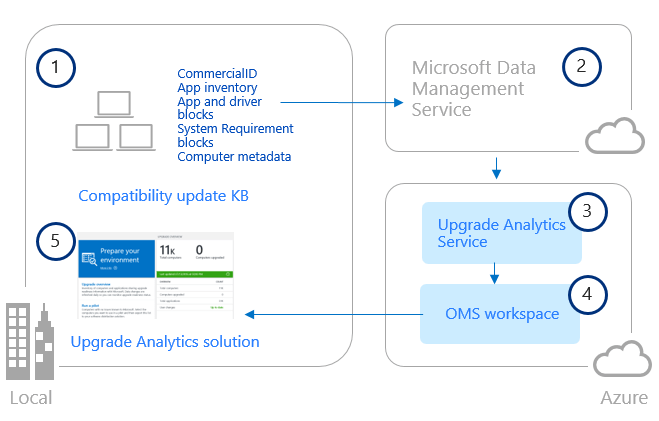 So the conclusion to all of this, to quote Microsoft, is: “The easiest Windows upgrade ever.” Yes, there is still work involved, but you can effectively use the Upgrade Analytics OMS solution to help guide you through the process. Why not get started today in leveraging this powerful (and free) tool! Visit my blog or Twitter page to subscribe and follow me for more content.